Chants and hymns, monks in maroon robes, meditating Buddha and unparalleled knowledge are some words which are synonymous to Nalanda. Nalanda University is the oldest university in India. Sited in the Bihar State of India, it is believed to be founded in the 5th century AD. A combination of two words, it literally means the “Giver of Knowledge”. From centuries Nalanda is recognized as the epicenter of higher learning. This place has great significance in Buddhist history, as it is believed that Lord Buddha visited this place many times in his lifetime. Also it is the abode of Sariputra, who was a follower of Lord Buddha. An ideal place for the people who want to know more about yesteryears, it has so much to offer. This place is the testament of the religious significance and devout bequest. Some of the main attractions of this city are The Great Stupa, Nalanada archaeological museum, Nalanda Multimedia Museum, Hiuen Tsang Memorial Hall and Nav Nalanda Vihar. 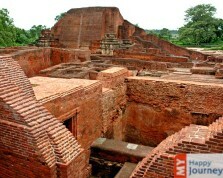 Apart from the famous ruins of Nalanda University, Nalanda has a lot of things of interest. The tomb of Bihar Sharif is a popular attraction. It is the place where a yearly Urs is organized at the Dargah of Malik Ibrahim Baya. Baragaon, just 2 km away from Nalanda, is renowned for its sun temple. Chath Puja is the festival, which is celebrated with great fervor here. An International Center for Buddhist Studies, which came into existence in 1951, is also worth a visit.